Open letter to the 64 countries fighting ISIS: What the F—- is this tank doing there? So supposedly you all are out there fighting ISIS? You’re flying missions, bombing Daesh, defeating the Jihadis. This has been going on for more than a year now. All of the countries that fought on both sides of the Second World War, and another 40 countries, are all fighting together, in the greatest alliance known to mankind ever in history, with the most expensive and precise weapons ever manufactured in history at your disposal. All of it to defeat ISIS. So what the #&%$ is that tank doing there? What tank? The one ISIS used to run over 19-year-old Fadi Ammar Zidan, a Syrian army soldier they captured and whose killing they video-taped. In previous videos Daesh showed some barren desert or unknown location of a house and people being murdered, but here we have a big, fat, tank driving down a road in broad daylight. And you couldn’t find it? What’s that doing there? A big, huge tank. A big, fat target. And all your hundreds of F-15s, F-16s, your B-2s, and your Rafales and Dassaults, your Migs and every other weapon known to man, and you couldn’t find ISIS has tanks and drives them around, hither and thither in broad daylight? You’re kidding, right? So what the hell does your “coalition” do all day when it “fights” ISIS? What is that tank doing there? I mean, seriously. What is it doing there. 64 countries, that’s a larger alliance than all the free people’s of Middle Earth brought together in the famous Last Alliance of the Lord of the Rings, but even they could have found that tank. You think if Sauron had a tank, they wouldn’t have noticed it? What does the coalition do? What is this “war” on ISIS? The only real war you people are fighting is the one for your paychecks, to go home after this rotation and pin medals on your chests and say you fought ISIS. The 64 nation coalition has done less against ISIS in a year than the Kurdish YPG or the Shia militias do in a week. I mean, what’s that tank doing there? We need to talk about this tank. ISIS has this tank, and probably many others, and it drives them around in broad daylight, and 64 countries with satellites and all the fancy technology, can’t find it? Daesh can film Hollywood movies with tanks and you can’t destroy them. What the F— is that tank doing there? I mean really…think about it, we’ve been told that you’re “fighting ISIS”. But ISIS is expanding, it is driving back and forth, reinforcing its lines, killing people, keeping its state intact, raising taxes, executing people. Your “coalition” hasn’t made a dent in it. It hasn’t done anything. ISIS is probably stronger today than it was a year ago. And that brings me back to the tank. What is it doing there…relaxing and driving over people, probably for multiple takes, for takes, while your “coalition” did nothing? No one is wondering why you let ISIS take Palmyra and destroy it. No one is wondering why you let ISIS exterminate Yezidis. We’re not asking why you’ve had no impact. We just want to know…how the &%*# it’s possible that ISIS drives around with tanks and thousands of your “coalition” aircraft can’t find it, can’t impede it, interdict it…neutralize it…splatter it…swat it…take it down…push the button on it…shack it. 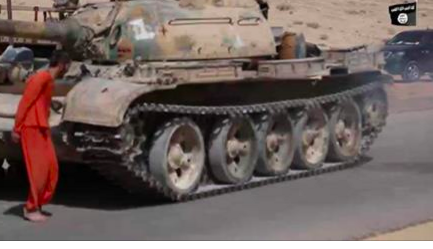 if anyone trusts this nonsense about the “coalition fighting ISIS”…just ask…WHAT ABOUT THAT TANK???? Maybe you should go over there and point it out to them, instead of finding a photo and running with it. You should just send the rest of the Couch blogging armies of America. Actually we were over there with the Kurdish fighters. The only person who is ignorant is you, who thinks that these 64 countries are “fighting ISIS”, when in fact they are not doing almost anything. My ancestors fought in real wars like Vietnam, the Second World War and the First World War and actually fought against the enemy. This “coalition” fighting ISIS is not fighting ISIS in a way intended to win a war. So I suggest you go over there and watch ISIS as it runs very successfully its state in the supposed face of 64 nations that are “fighting” it. The only people fighting ISIS are the Kurdish militias and the Shia militias. Both of whome have been successful against ISIS using minimal equipment often.